This is the work for generating a real-time facial expression animation based on an individualized wireframe model avatar. The tracking and head pose detection (developed by Dr. Qing Ji) and animation (developed by Dr. Lijun Yin) in 3D space are conducted in real-time. The face animation is based only on 22 fiducial points of a performer. This is the collaborative work with Dr. Qiang Ji from Intelligent System Lab, Rensselaer Polytechnic Institute. 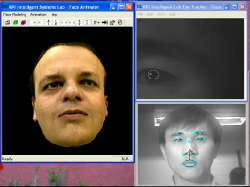 A realistic face modeling and facial expression analysis and systhesis system is developed. The system consists of face topo-feature labeling, facial model adaptation, texture of interest detection and facial expression reconstruction. The material is based upon work supported by the NSF under grant 0414029. Any opinions, findings, and conclusions or recommendations expressed in this material are those of the author and do not necessarily reflect the views of the National Science Foundation.